For National Small Business Week (June 17-24), CAMEO honors Assemblywoman Mariko Yamada, (D-Davis) and Assemblywoman Cheryl Brown, (D – San Bernardino). The assemblywomen introduced two bills this session that would increase self-employment within the workforce system. If we’re going to celebrate small businesses, we must also celebrate the self-employed. CAMEO honored these two women because they recognize the importance of self-employment as job creation. Assemblywoman Cheryl Brown, (D – San Bernardino) is the author of AB 285, Micro Enterprise: Economic Development, a bill that encourages the California state Workforce Investment Board to set guidelines for local WIBs to incorporate entrepreneurship training. This bill has passed the assembly and is moving through the Senate unopposed. Assemblywoman Mariko Yamada, (D-Davis) authored AB 152, Self-Employment Assistance program, a bill that would allow the unemployed to keep their benefits while starting their own businesses. The bill remains in the appropriations committee because the state says that the cost of the program exceeds the $5.3 million available from the federal government to run the program. 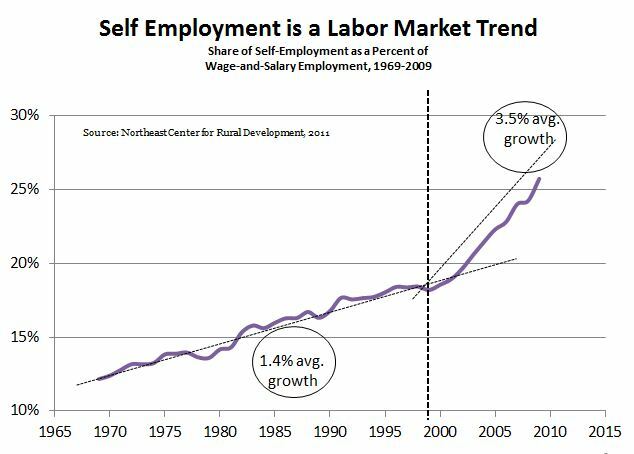 Self-employment is a labor market trend; self-employment was more than 25% of wage and salary employment in 2009. Pre-2000, self-employment grew at an average of 1.4% a year; post-2000, self-employment grew at an average of 3.5% a year (see graph). According to Emergent Research’s State of Independence report, independent workers will grow by 35% by 2017. CAMEO’s mission is to grow a healthy, vibrant, thriving environment for all entrepreneurs and start-up businesses by advancing the work of our statewide member network – the over 160 organizations, agencies and individuals dedicated to furthering the growth of micro-businesses in California.